My SCA household has a gift exchange every year where we draw names. This year I drew Katrina, and this years theme was 'make the campsites look more period'. I knew that what I wanted for my own campsite was rugs, tapestries, lanterns, and a few chests. It turned out that Katrina camps in a mundane tent, so I couldn't do tapestries for her. Rugs seemed to pricey. Finally I became obsessed with the idea of making her a chest. I found plans online for a six board chest she can use as a seat and as a place to hide her mundane gear. I decided to paint her device on the front. Nevermind I didn't own a single piece of woodworking equipment . . . . Although this was technically a Christmas Gift, our gift exchange was not until the weekend of February 5, for scheduling reasons. That let me take my time and get everything done as well as I could. It was really frustrating to me not to have woodworking equipment when I needed it. I grew up only a few miles from my Grandaddy's workshop and my Dad took the time to teach me to make stuff. 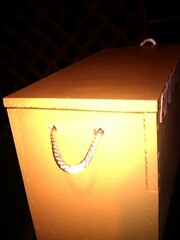 Anytime we needed something, like a printer stand or a wooden box, we could just go and make it. But now I don't have those things at my house or close by, and I had to figure out how to get access to the tools I needed. So my friend Liam did the rip cuts with his compound miter saw and then the not-dovetail notches he cut with a jig saw. The smell of sawdust was wonderful after all these years and I decided I would do my best to start acquiring a wood-shop of my own. For the main construction of the chest I just glued all the joints and clamped them until they were dry. 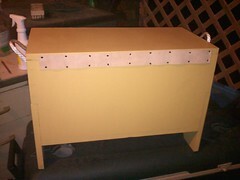 Then I drilled quarter inch holes along the edges and hammered in some dowels (also glued). When that was dry I flush cut the dowels and sanded everything. 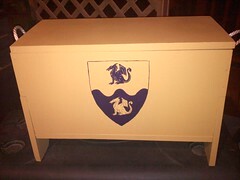 I used milk paint for the body of the chest and acrylics to paint her SCA coat of arms on the front. Another friend contributed to the project by giving me some leather scraps I could use as a hinge. I did at least own my own drill (Thanks, Dad!) so I made my way to the hardware store the week after Christmas and bought a selection of wide bits. The holes I ended up using for the rope handles were make with a 5/8 bit. I have another chest's worth of boards cut out and waiting in the garage and plans to make a couple more after that. Chest #2 will be pine, but after that I will need to look for some better wood. Pine i very affordable, but the warping caused me some problems. Also, I need some wood that will take stains well. But anyway, with help from friends and with the skills I learned from my Dad, I got it done! and a place to put things is such a wonderful gift! I know it's been a few years since you posted this, but do you happen to still have the plans for a 6 board chest? I'm looking at making a few soon, but am in need of plans. Thanks!